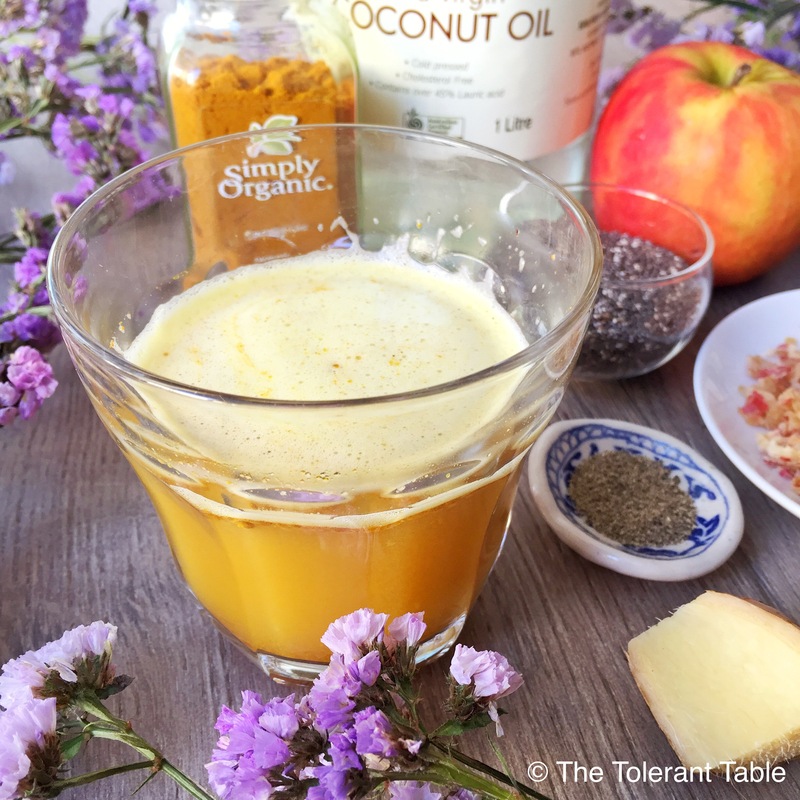 I used to make this little anti-inflammatory shot for myself every morning a couple of years back to help keep my inflammation levels in check and to help with daily symptoms such as itchy eyes and runny nose (I didn’t know it was histamine intolerance at the time!). It was a morning routine with great benefits, but for whatever the reason I fell out of the habit of doing it. I’ll probably have to put that down to hectic Uni schedule… terrible excuse that it is. I did start-up again last week though, because the itchy eye thing was driving me nuts. You know when you can’t decide if they’re itchy, burning, gritty or all three and you just want to keep rubbing them because it seems to help? Ugh! I like to make this just before I leave for uni and again when I get back in the afternoon. I find the morning shot will get me through quite a lot of the day, then the afternoon one gives me an anti-inflammatory top up for the rest of the evening. I also had three lovely friends with hay fever give this a whirl for me and there was general consensus that it definitely helped with their symptoms, which was wonderful to hear. I’m not suggesting anyone toss away their herbs, supplements or medications and replace it with this shot by the way, I just think it’s a delicious little tonic to add into your day. The one thing I will say about it is it’s very spicy! If you’re not quite ready for that just use the amount of ginger, turmeric and pepper you’re comfortable with. Drink down in a few sips and enjoy the little morning zing! Hi, I love the idea of this shot. Anything to help with my sniffles, Chloe. Love this recipe! I usually have a similar “shot” in the mornings, lemon squeezed in cooled green tea, turmeric, black pepper, and apple cider vinegar. I will try this recipe for the afternoon! Which juicer would you recommend?